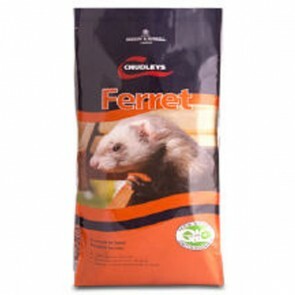 We stock Chudleys and James Wellbeloved Ferret Food varieties that contain high levels of protein and fat as ferrets have high energy requirements and shorter digestive systems than cats or dogs, consequently any benefit derived from digesting plant fibres or seeds found in other complete pet foods is limited. Both James Wellbeloved and Chudleys Ferret Food recipes are extruded diets, that are formulated using pellets and contain high levels of protein and fat derived from poultry, that can be left in your ferret's bowl, unlike raw meat or chicks without worrying about flies, that can cause digestive upsets! Feeding an extruded ferret food also prevents selective feeding whereby your ferret only eats the bits they fancy from a complete muesli mix and therefore misses out on any of the nutritional benefits of the remaining uneaten ingredients in the food. 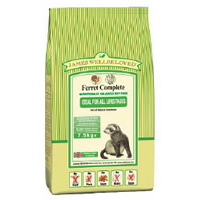 An extruded ferret food like james wellbeloved or chudleys includes all the same ingredients as a muesli mix, but squashed into pellets, thus your ferrets will benefit from a complete nutritional balanced diet. Unless you are feeding fresh food, ferret owners should ideally have dry food available at all times, as they need to eat frequently every 3 to 4 hours approximately, due to their quick metabolism and short digestive systems. Unlike some small animals, ferrets will normally only eat what they need, consequently making food available constantly is not a problem as ferrets don't normally gain excessive weight and become obese. Like all small animals it's advisable to supply your ferret with plenty of fresh, clean drinking water and if you find your ferret is gaining too much weight, maybe consider a visit to the vets to make sure there is no underlying medical problem that needs to be investigated further. But normally increasing your ferrets exercise will decrease their weight, rather than restricting the daily intake of food, if no health problem is identified. Many owners find modern extruded ferret food's like James Wellbeloved and chudleys more convenient to feed, as they can be left out all day without concern, unlike canned ferret food that should be given sparingly or as a treat to supplement your ferret's favourite dry food to provide them with a little extra variety! As with most pets, it's advisable for ferret owners wishing to change foods to gradually introduce the new food over several days, slowly reducing the amount of the old complete food, until you ferret become accustomed to the texture and taste of the new food. Ferrets are notoriously stubborn and we often suggest to owners with young ferrets to try them on several different brands of ferret food, as older ferrets can be reluctant to try new foods, just in case you can't source your usual brand of ferret food. Ferret Food: 5 stars out of 5 based on 0 user reviews.